Here it is the #1 Tour de France Bike Tour in Cycling Paradise – Lake Annecy! Come and experience the opportunity of a lifetime at the 2019 Tour de France in Annecy the French Alps with the ultimate quality bike tour from Practice Bicycle Tours. The epic 2019 Tour de France route comes to a climax with 3 classic alps stages on roads we’ve been exploring for 20 years around Lake Annecy and the French Alps, escape the norm and immerse yourself in authentic France with this premium quality small group bike tour week. The Tour de France is the pinnacle of the season for cycling fans and the Practice Bicycle team, who have a special passion for cycling and International racing ready to share with you. You want to feel like you belong and your not just another tourist in the group… in fact you want to totally escape, both on your bike and whilst relaxing…. a real cycling holiday! Crazy, Chaos, Thrilling, Amazing it has to be a Century in Yellow with the Tour de France 2019 the greatest sporting event in the world! The 106th edition is a high altitude challenge affair with the final 3 french alps summit finishes over 2000m, Col du Galibier, Tignes and Val Thorens. Experience the best cycling of your life and make your own memories whilst in Annecy. Who will light up the French Alps at the Tour de France in 2019? Experience the best of both worlds with Practice Bicycle, the ideal balance between quality cycling, amazing race viewing and relaxing in a small group environment which is enjoyed by all our discerning bike riders and non-cycling guests. Looking for Italian race action in May? Join us for the Giro d’Italia Bike Race Trip, this fantastic race action on the roads of Italy and the principality of San Marino the best of Italy ! Tour Type Ride and watch the best bike races in the world, together with the professional that live it! Our bike race tours combine the best cycling with bike race viewing and relaxing. Experience the bike races like you have never before! Activity Level Because our bike race tours are always based at a single location based on the race route, we can tailor the rides to meet your cycling requirements and abilities. Available Packages All our prices are AUD $ per person based on twin share accommodation. If you are an individual guest, a single room surcharge will apply. Optional Extras Bike Hire - Quality carbon road bikes shimano compact 50,34 x 11,29. That’s ok, we cater to non-cyclists too! Our Tour de France Non Cycling tour package is for any fan of world class cycling who does not wish to ride and prefers to spectate during our Tour de France 2019 Bike Tour. The perfect solution for a non cycling wife/husband/partner to accompany the Bike Tour rider on their spectacular Tour de France Cycling Holiday whilst in Lake Annecy the French Alps. We just wanted to say how much we loved the whole TDF week with you both - brilliant in all ways. The attention to detail, the huge variation in each of the day's riding through such beautiful country and amazing little villages was just fantastic - culminating in that most amazing descent on the last day. ( not so good on the time trialling Paul) but just loved the climbs. Again thank you both so much for an amazing experience and all the little extras that didn't go unnoticed right down to the musette bag of goodies. Jen cannot thank you both enough for the amazing support you gave her which we both incredibly appreciated! The week was an unforgettable experience both in riding and the thought that went into each day's restaurant lunch experiences. Very best wishes from us both. Below is the 2019 itinerary with limited places available book today. Our first ride together and what a ride it is, the breathtaking lap of Lake Annecy, the cleanest Lake in Europe, surrounded by the Forrest mountain of Semnoz on the west and the massive La Tournette (2351m) and the Grand Alps to the east. 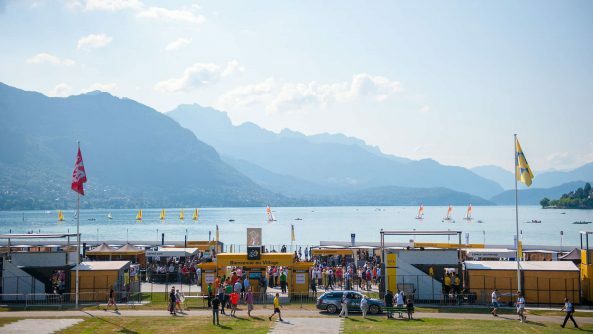 The perfect way to begin the most exhilarating week of riding with Practicebicycle Tours at the Tour de France 2019 in Annecy the French Alps! Leaving Annecy Centre Ville at a leisurely pace, it’s not long before we are following the contour of the Lake. It’s easy to see why we like to take in this gentle ride…..so much to see in such a short period of time! This amazing route was also the Time Trial stage of the 2009 Edition of the Tour de France, great memories of a classic day at the races. For those wishing to take on gravity on their first day with PRACTICEBICYCLE we can complete the full Time Trial route and try and emulate Alberto Contador with his winning effort, plus an optional classic Col from the Criterium Dauphine bike race. Stopping for a café and patisserie at one of our favourite bars on route is the icing on the cake and slows us down enough to experience the pace of French life before the action really hots up later in the week! 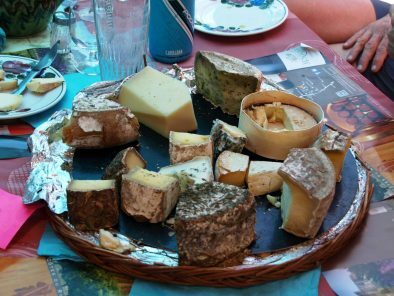 Complete the perfect opening day at your Tour de France in 2019 with a Welcome Aperitif together followed by Gastronomique Dinner at one of Annecy’s finest Restaurants to experience the best flavours of French cuisine! With the Tour peloton in Provence and speeding north towards us in the Alps, we can slow down a gear and enjoy the classic roads of one of last years TdF Alps stage and the slopes of Plateau Glieres. Heading north following the edge of the Alps and the Tete du Parmelan, these breathtaking views are part of your daily ride routine with Practicebicycle, today is no exception as we slowly climb through the forest of the Col de Frettallaz (670m) and all the splendour of Alpine views. These secret country roads have everything from Chateaux’s to Plateau’s perfect to escape and appreciate all the pleasures from great riding as we head towards one of the hidden secret valleys. This historic area was a strong hold of the French Resistance during World War 2 and an impressive memorial awaits us at the summit. Warm up your own Tour de France legs today on the Col des Fleuries or head straight to the Col des Glieres; enjoy these great roads and the peace and tranquility before we catch up with all the action of the Tour de France peloton in the days to come. What a perfect way to spend the day who would have thought a bike tour to the Tour de France could be this great with the best guided riding in the world stress free! We are always spoilt for choice when it comes to picking and tailoring your great Tour de France ride routes around Annecy during your stay with us. With Le Tour taking advantage of these superb cycling roads each year, we also enjoy showing you every direction as the best way to show case ‘Cycling Paradise’ for you in one short week! This 2017 stage route was decisive for all the wrong reasons with rain and falls resulting in many of the favourites out of the race. It’s called the pre-alps and shadows the largest river in France the Rhone, with 5 cols along its length it made for a huge stage for the professional peloton. We can experience one or two Cols and this amazing landscape and Rhone valley perfect for cycling. After a gentle climb out of town it’s not long before we are into the picture postcard undulating French countryside and heading into the next valley dotted with local vineyards. A local café stop is never far away and just as importantly with quality cycling routes a well-deserved gem restaurant lunch will top off a fantastic day. These superb roads are here for you to experience as much or as little as you wish with your Professional Team in the French Alps. This afternoon is arrival day for guests joining us on the Silver 5 Day TDF Package. 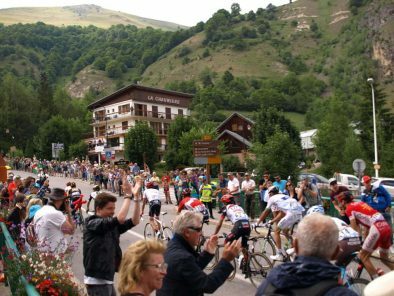 NON CYCLING GUEST: Share all the Tour day & spectacular TDF Action in Valloire! Today the Yellow Jersey battle hot’s up with the professional peloton hitting the Alps for the three consecutive decisive alpine stages and our first live race action of 2019. After experiencing yesterday’s Rhone river valley what a contrasting opportunity awaits us today as we head deep into the High Alps and on top of the world…it has to be experienced to be believed! 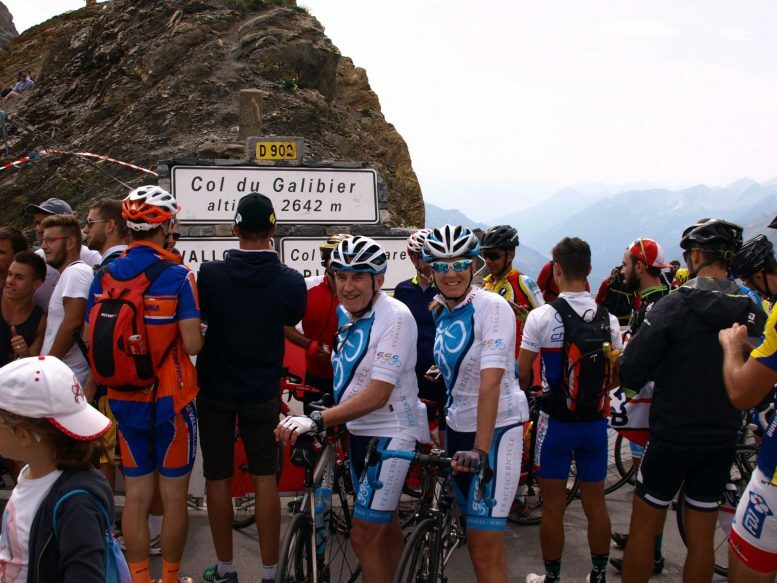 Flexibility with our premium small group allows for the best ride options, why not test your legs with one of the classic cycling challenges of all time…the Col du Galibier (2642m 35km @ 5.5%) this one is for the mountain goats who love to climb then the summit awaits you, before descending in time for an Alpine recovery lunch! If you’d prefer to pace your legs this week then the Telegraphe is a perfect challenge, whichever you decide look forward to a great day at the Tour de France. Once refreshed we are at the ideal spot with time to relax, recover and enjoy the rest of this special day in this wonderful ski village in the heart of the High Alps and all the finish line excitement of the Tour de France stage 18 in Valloire. 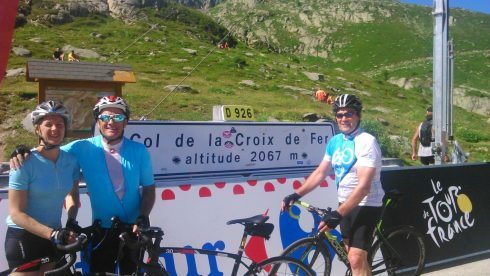 NON CYCLING GUEST: Share all the Tour day & spectacular TDF Action in Tignes! What these 2019 Tour de France final Alps stages lack in distance they certainly make up for with altitude and intensity! This is the second of the trilogy and you can only imagine what the peloton will be experiencing on the slopes of the Col de l’Iseran (2770m) the highest point in this year’s Tour de France before the final climb to the finish line in the ski resort of Tignes. We will have an early start today as we transfer by vehicle to the race route and the slopes of Tignes. This world class ski arena will be the setting for world class professional cycling action as the very best fight for the yellow jersey on classic roads of the French Alps. Feel like a pro yourself and enjoy your own memorable ride to our ‘unique viewing spot’ and the final decisive action of stage 19 deep in the Alps. With a choice of two magnificent cols available to you or this might be the day to rest the legs, leave the climbing to the Tour de France peloton and watch the suffering faces of the very best climbers in the world with a well-deserved rest day (repos). 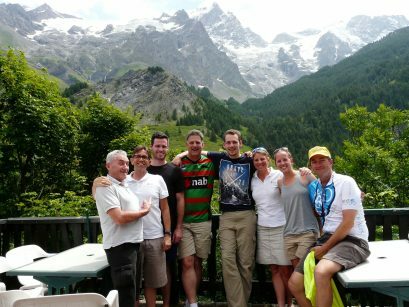 With all the local knowledge of the Practice Bicycle team, escape in the Alps with the best flavours of the mountains and a hearty restaurant lunch at the roadside atmosphere and spectacle of the Tour de France race. Here it is the day that decides the winner of the Tour de France 2019 in the French Alps, including your own fantastic opportunity to ride on the final stage race route in the Grand Alps! This Three Valleys Ski area culminating with the final 33.4km ascent to Val Thorens is the only place to be in this year’s Tour de France, when tired legs cannot hide and after 3 weeks of racing through France only the very best will get on the podium in Paris! Absorb these incredible roads one last time with Practice Bicycle as much or as little as you wish. Visit the winter Olympic town of Albertville and pass by mountain monuments on each side, some with famous names that you may have seen on TV in previous Tour de France battles and others just as awesome in their own unique way. It’s not long before we are on the race route and enjoying our own challenge as we head to our ‘unique live viewing spot’ with live action from the roadside. With an endless choice of superb rides planned throughout the week, take on one final challenge of Val Thorens (2365m 33.4km @ 5.5%) to top off the perfect cycling week full of your own memories of the 2019 Tour de France. Local knowledge is everything on your Practice Bicycle Bike Trip, relax over hearty restaurant lunch together explore French village life and get ready for the show to begin! Once refreshed we are at the ideal spot with time to relax and enjoy the rest of this special day and one last memorable moment to absorb the professional peloton in the French Alps during this year’s Tour de France! Unfortunately today is your departure day, PRACTICEBICYCLE are available to assist you with packing your bike ready for your onward journey from Annecy. Your team will say good bye this morning and transfer you to Geneva International Airport (Switzerland) for your midday departure. PRACTICEBICYCLE wish you a “Bon Voyage”, safe cycling until we Practicebicycle together again. *As with all the PRACTICEBICYCLE planned rides you always have the option of taking it easy and enjoying the comfort of the support vehicle and all the spectacle of the day at a more leisurely pace. 3* Hotel Splendid accommodation located in the heart of Annecy undoubtedly the most beautiful town in France. The ideal location to make your Tour de France 2019 a trip of a life time! Why would I choose the Tour de France Silver 5 Day Package? If your short on time our Silver 5 Days package (24 – 28 July) is the answer for a flying visit to the spectacular Tour de France. We can’t get enough of ‘Cycling Paradise’ and Lake Annecy, but if you’re looking for race action days only, it’s okay. Join us in Annecy for 4 Nights including Airport pick-up & drop-off at Geneva International Airport, Switzerland (arrival 3:00pm & departure midday) plus all the action in the majestic high alps. 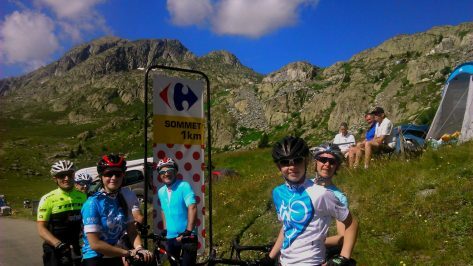 With the same quality and details as the 7 Days Package, 3 incredible rides of your life including all 3 Tour de France Alpine stages fully supported with the team that live it! Take a look at the Itinerary above for more on each action packed day. Will I have enough to do off the bike? Lake Annecy is one of the best places in the world to relax and explore – also off the bike! The ‘Pearl in the box’ town often referred to as the Venice of the Alps is the absolute perfect base for your Tour de France bike tour and ideal for relaxing and sharing with non-cycling partners. You may choose to wander the enchanting streets, do some shopping or just sit by the lake and admire the spectacular views and watch French life pass you by. The team can assist you in choosing from the many superb restaurants, bars and salon du teas in the home of Practice Bicycle, Annecy. Spend your evening enjoying a lovely meal just like a local, ready for your next action filled day at the Tour de France in the French Alps. Bon soiree! Am I fit enough for this trip? Whether you have years of cycling experience or are just new to the bike, as long as you are excited by the best cycle racing in the world, this Tour de France trip is for you! Each cycling route during your 2019 Tour de France Bike Tour will be tailored specifically to your bike riding ability and experience, including the opportunity of riding on parts of the stage route. So you can have a challenging ride or a comfortable ride – the choice is yours. What activities, tours will the Non Cycling Partner do whilst I am on my bike? 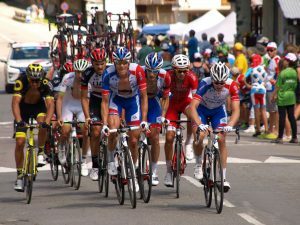 As a Tour de France Non Cycling guest and bike race fan you experience all the spectacle, excitement and action up close and personal of the bike race live. 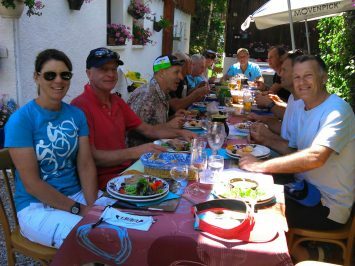 Our local support team will share with you culture and villages on route whilst catching up with the cycling group at our ‘Unique live viewing spots’ and handpicked restaurant lunch together. Is this trip challenging enough for me? We enjoy a challenge as much as we love cycling. 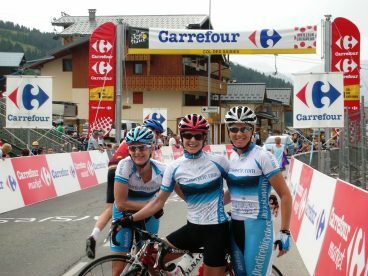 The team at Practice Bicycle has a history in professional bike racing, your host Bridget Evans competed in the 1999 Grand Boucle Femmine (Women’s Tour de France). So if it’s a challenge you are looking for, we can definitely find just the right rides for you. Each day a choice of rides are available with one perfect for you. After all, the area around Annecy is home to over 20 classic Tour de France cols! 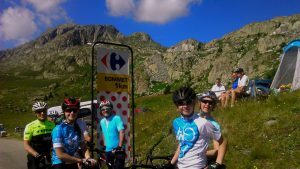 If you are looking to improve your cycling then take a look at both our winter and summer training weeks available in the French Alps and Portugal. Looking to experience the Tour de France 2019 with a Day Tour? 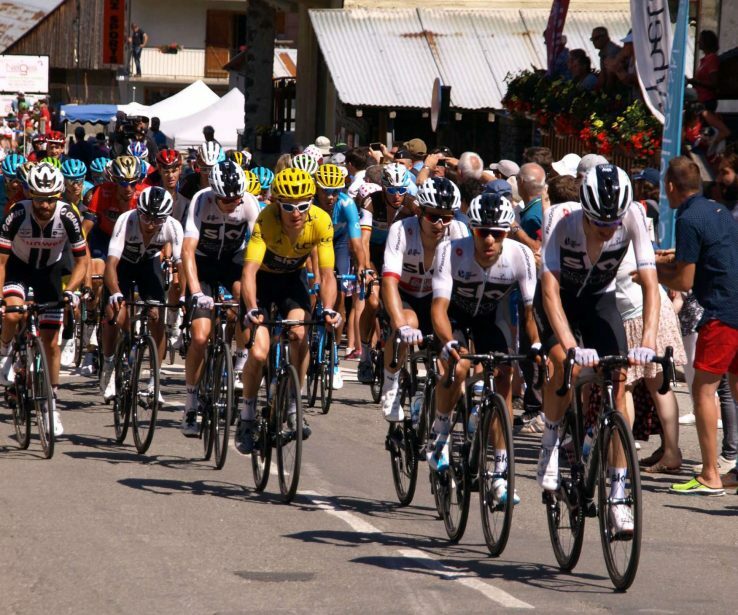 The Tour de France 2019 can be enjoyed for just a day or two with an exciting and thrilling DAY TOUR, including a restaurant lunch so if you’re looking to get a taste of the biggest sporting event in the world in 2019 then experience it in style with the professionals who live it! Also perfect for the Non-Cycling Partner who wish to be a part of the Tour de France live on the roadside for the day! 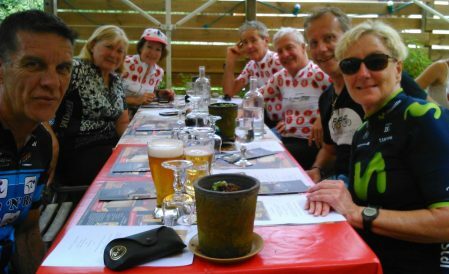 TDF Day Tours (25,26,27 July) Each day join the Practice Bicycle Team at a convenient central Annecy meeting point, ready to ride just like you would back home. 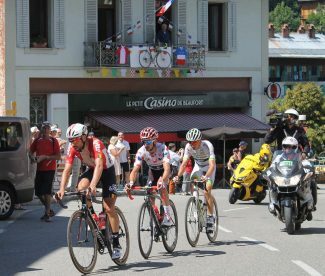 Fully escorted and supported on the final 3 Alps stages of the 2019 Tour de France at our unique live viewing spots including French restaurant lunch. What rides will I do? We offer a choice of daily tailored rides to meet the experience of our cycling guests, including actual Tour de France race routes, take a look at the itinerary above. In addition Practice Bicycle has developed 100+ routes in Annecy for riders of all levels with over 20 years cycling in the Rhone-Alps of France. To get an idea of what sort of rides you will be doing, have a look at a sample of our rides in Annecy. Why do you choose to watch 3 stages at the Tour de France bike race tour? 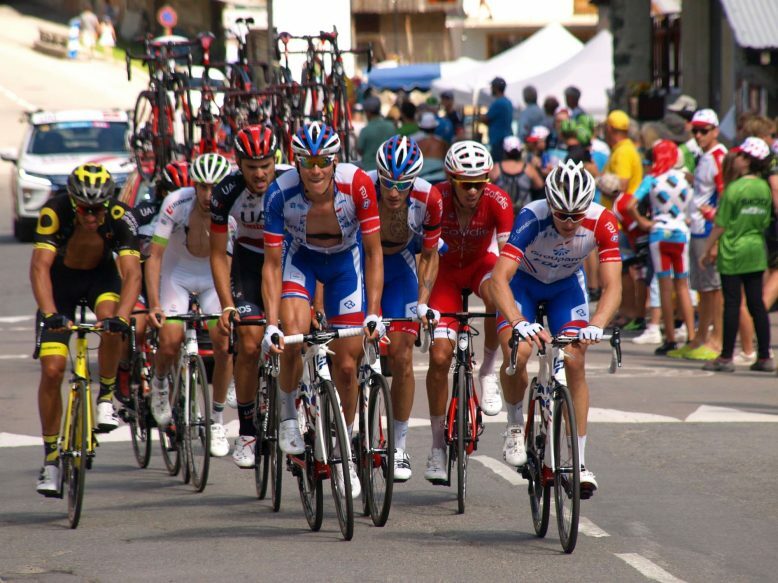 Our specialty bike race tour weeks include viewing the Tour de France bike race on 3 stages. We believe that this is the perfect ratio of maximising your enjoyment of viewing the race action live, contrasting with your own variety of personally tailored rides and the opportunity of enough time to relax and experience your idyllic French Alps location for the week. I have already booked accommodation - is the Bronze Rides Only package for me? Absolutely! Look out for our Bronze Rides Only package (22 – 27 July) to get on this tour without any add-ons & accommodation. Each day join the Practice Bicycle Team at a convenient central Annecy meeting point, ready to ride just like you would back home. Fully escorted and supported on 6 amazing rides including a welcome ride, 2 TDF routes from the past and the final 3 Alps stages of the 2019 Tour de France at our unique live viewing spots. 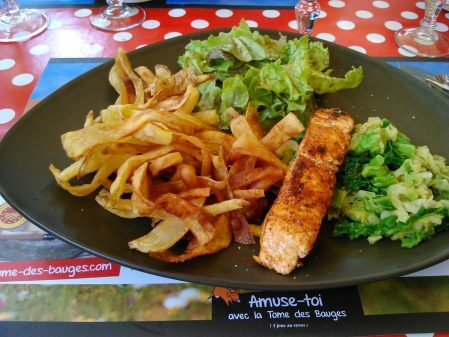 The Bronze Rides Only also includes 5 superb French restaurant lunches. 6 French continental buffet breakfasts a perfect start to the day. 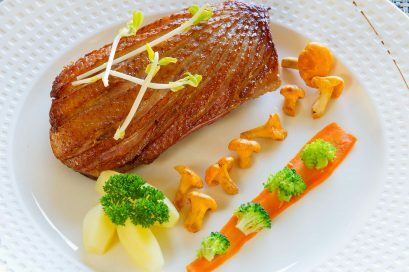 2 Exclusive restaurant dinners at Annecy’s finest gourmet restaurants. Escape to the Mountains discover the natural beauty of the High French Alps. Visit Lac Bourget, Plateau Glieres, Albertville, Tignes and Moutiers the centre of Les Trois Vallées ski resort. 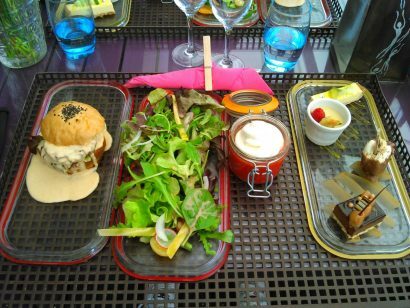 Very best flavours of France in hidden gem Restaurant lunch settings including Tour de France lunch in the majestic high Alps . Challenge of the giants of the French Alps, Col du Telegraphe (1566m), Col du Galibier (2642m), Cormet du Roselend (1967m), Tignes (2089m) & Val Thorens (2365m), take on one, take on all the challenge is yours! Memorable Tour de France unique live viewing at the stage finish deep in the French Alps and on top of the world!